Cupcakes have been around a while now and more and more cupcakeries have popped up all over Singapore, making the cupcake market a very saturated one. Every shopping centre or lane seems to house a cupcakery of some sort whether it is the ever popular Muslim-owned Fluff Bakery and SPATULA (who are opening a new outlet) or Daniel Ong and Jaime Teo’s 12 Cupcakes. Their recipes may differ from shop to shop but many of the classic flavours remain the same, from your favourite red velvet to chocolate cupcakes. In our very saturated cupcake market in Singapore, Simply Nuha caught my attention because they were doing something unlike their competitors. 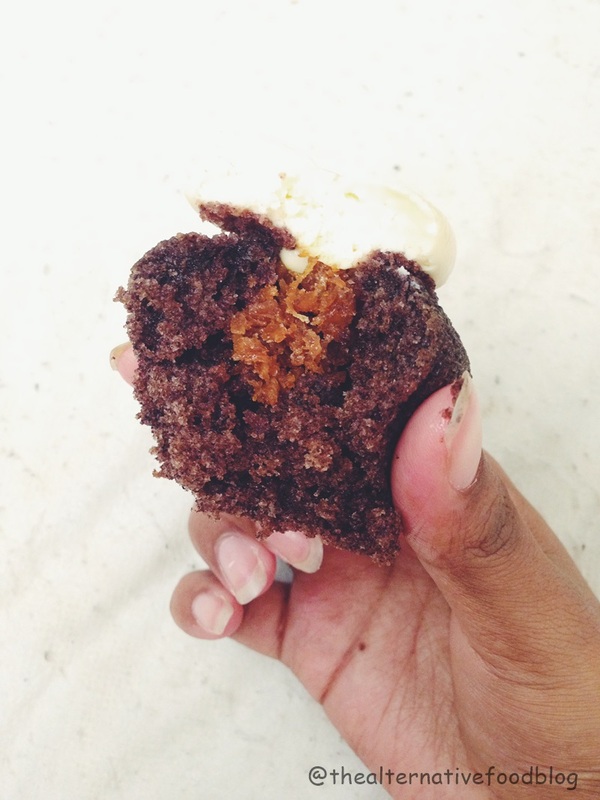 Instead of focusing on sweet or savoury cupcakes, their creations were based on traditional Malay kuehs. I first heard about Simply Nuha when Kit and I called for recommendations for bakers to be featured on our humble site. A short while later, while Kit and I were enjoying a bowl of chendol at Penang Culture,I thought about what it would taste like if gula melaka was in a cupcake. 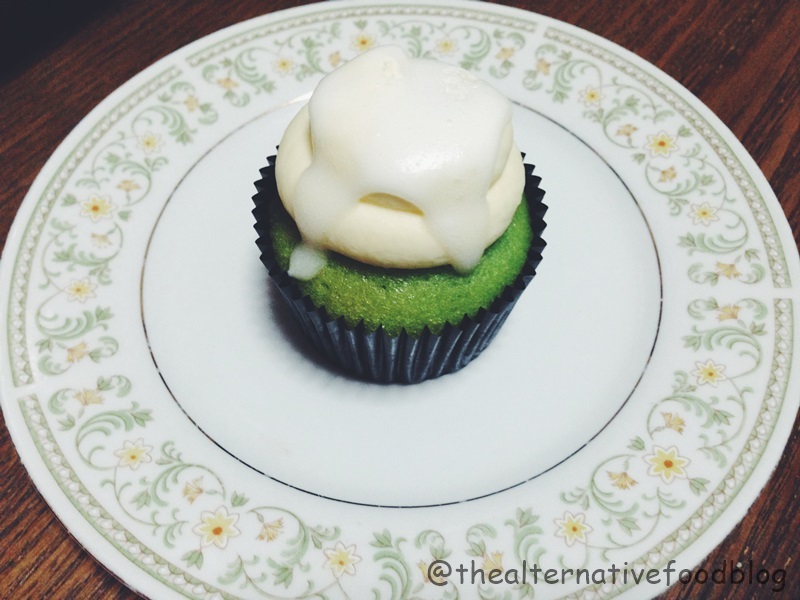 Initially, I was a little skeptical about the idea of a kueh-type-cupcake because I am a cupcake purist and the idea of combining both of them together did not bode well with me. However, the more Kit talked about oozing gula melaka, the more I started to crave the cupcakes. 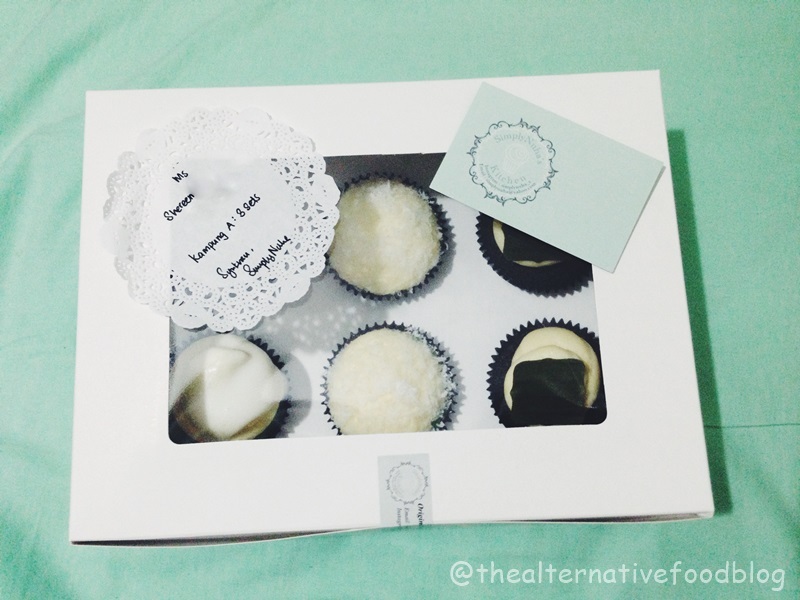 Since Kit and I both stay in the North, and self-collection for these cupcakes were in the East, we opted to have them delivered to us for a fee of $15. I was told that this fee is really based on your location. Delivery is outsourced to an non-affiliated courier and so cash had to be paid directly to the courier. Honestly, it was really quite fuss-free and since there were three of us ordering it, we could split the courier cost three ways. For the record, I am a very fussy cupcake eater. I am very particular about whether a cupcake is too dry or too moist, too crumbly or too gooey and so, I was rather worried about the taste of these traditional cupcakes. I also think I was worried that the cupcakes would do no justice to these wonderful traditional Malay kuehs. All my worries were put to rest the moment I sank my teeth into the ondeh-ondeh cupcakes (pictured above) because these cupcakes are seriously one of the best cupcakes I’ve had in a while. It is not too dry and the batter is not too wet either, plus, the addition of the gula melaka keeps it very exciting. I really liked how much attention was paid to trying to preserve the integrity of the original kueh itself – from the appearance to the actual ingredients in the dish. However, as it still is a cupcake,there needed to be some sort of cream on the cupcake but instead of fresh cream or butter cream, I liked the idea of the cream cheese frosting that finished the cupcake. In preserving the integrity of the dish, there was of course, oozing gula melaka. How can you say no, really? As with gula melaka and cream cheese, there is a tendency to be too sweet, but this cupcake did not overpower in sweetness which was nice. 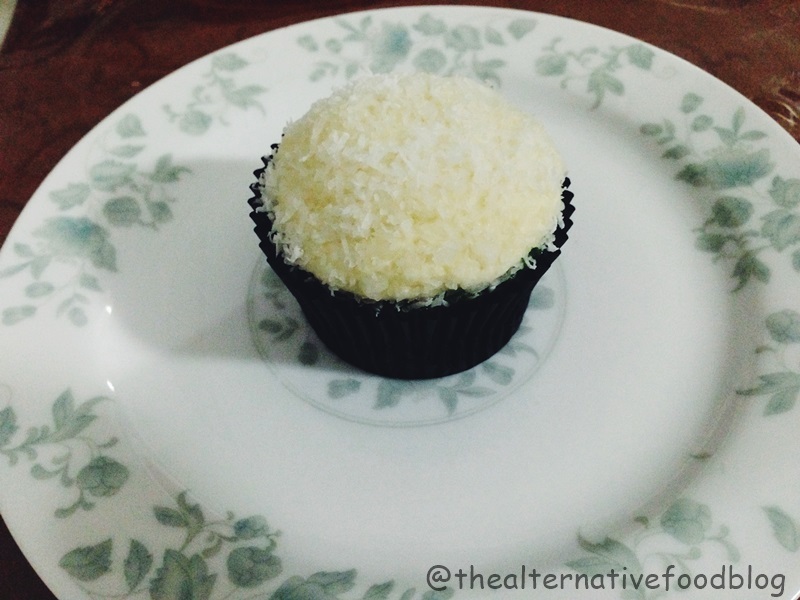 Pictured here is the badak berendam cupcakes were made with primarily the same ingredients as the ondeh-ondeh cupcakes. The base of the cupcake is just as good (probably the same mix) and because of the same ingredients used, it was a little hard to distinguish the taste of the two cupcakes and it did start to taste the same after a while but it was a really good cupcake, so I wouldn’t complain about it. 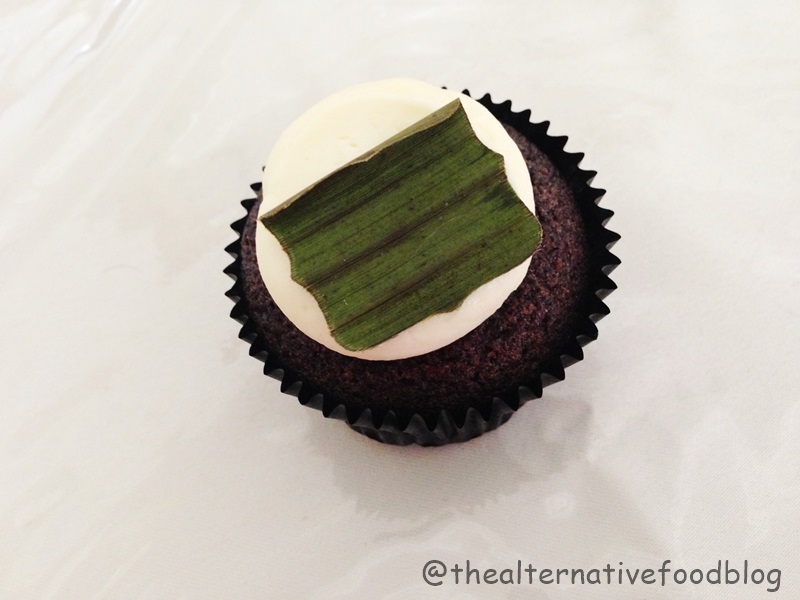 Despite the similarities between the two cupcakes, there are some differences mainly in how the ingredients are used. 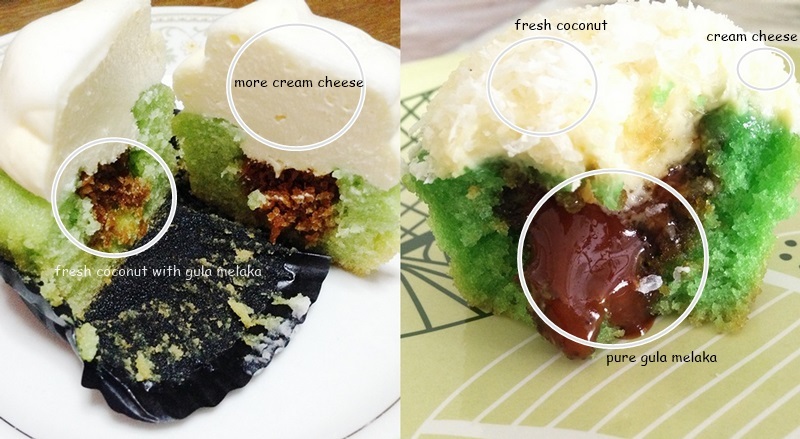 In the picture on the left (Badak Berendam), you can see more cream cheese and a different use of the freshly grated coconut as the filling as opposed to the picture on the right (Ondeh-Ondeh) where the freshly grated coconut finished the cupcake and the filling was pure liquid gula melaka. According to Simply Nuha, the freshly grated coconut is heated and stirred in a wok on top of the stove with pandan leaves in order to prevent the coconut from going bad too quickly. What I was the most surprised by were the koci cupcakes. In my mind, I expected it to be a little drier than the other two cupcakes but when I bit into it, I was surprised by the moistness of the cupcake and how good it tasted! The koci filling is of course, freshly grated coconut with gula melaka. Personally, what I liked about purchasing these cupcakes was the fact that the service was very personal – I got updates via Whatsapp about making payments and instructions about how to re-heat my cupcakes to best enjoy them. For me, it is always the little things that businesses do that make my dining experience a little more pleasant, and in this case, the team behind Simply Nuha did not disappoint. Simply Nuha are a home-based cupcakery so I was told by the creative geniuses behind the delicious cupcakes, that given these limitations, they take a limited amount of orders that they can manage. I’d recommend checking their Instagram for updates on when they’re fully booked / available so that you can place your orders in time. Our Verdict: ♡ ♡ ♡ ♡/ ♡ ♡ ♡ ♡ ♡ 4 out of 5 hearts. The gula melaka escaping out looks awesome!